Zayn is back with the video for “Dusk Till Dawn” and its a thinker. 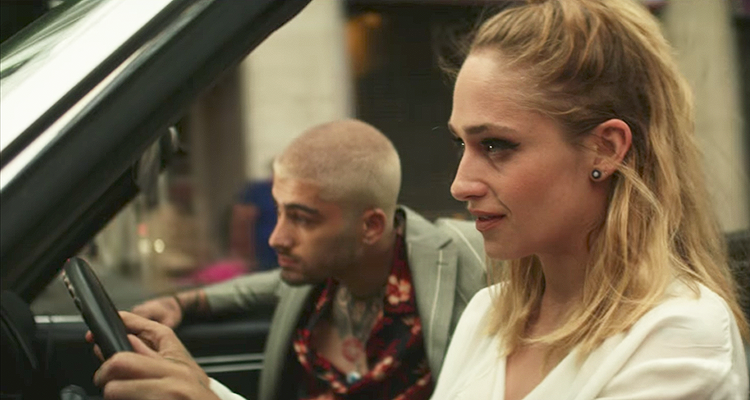 In the slick five-minute clip Zayn plays a mysterious loner tracking the movements of his equally inscrutable conspirator, raven-haired actress Jemima Kirke. Sporting his fresh buzzed-hair and wearing a sharp grey suit, Zayn follows Kirke’s character through a crowded Chinatown street scene, keeping an eye on her black briefcase until a group of cops confront him as the song’s soaring chorus kicks in. Following an interrogation from an officer, Zayn is released, only to ride out in his Jaguar with a private investigator in hot pursuit as he sings “I’ll be with you from dusk till dawn/ Baby I’m right here,” in his amazing falsetto. The moody track is the first single from Malik’s upcoming second album, co-written by the singer along with Sia and Greg Kurstin, who produced the song. Let’s hope the rest of the songs are just as good as this one.